Your eyes are often the first aspect that people notice about you, and an important component of your overall appearance. Young eyelid skin is smooth, but over time it stretches, and the fat around the eye begins to bulge. The eyebrows may also droop and sag, contributing to heavy upper eyelids and excess skin. Age, heredity, and sun exposure all contribute to this process. Baggy eyelids detract from your overall appearance and often make you look older or tired. When severe enough the upper eyelid skin may hang over the eyelashes and obstruct peripheral vision. Surgery to improve the appearance of the upper and lower eyelids is called blepharoplasty. The goal of this procedure is to give the eyes a more youthful appearance by removing excess skin and underlying fat. If the sagging skin obstructs vision then this procedure can improve vision and help return your eyelashes to the normal position. During upper eyelid surgery, excess skin and fat are removed through an incision made through the eyelid crease. In lower eyelid surgery, the incision is usually made behind the eyelid to remove excess fat. In this condition, the eyelid appearance is significantly improved and there is no visible scar on the skin. Cold compressors are applied to the eyelids for approximately one day after surgery to reduce bruising and swelling. Antibiotic ointment and drops are commonly used to help the healing. New York City blepharoplasty patients should avoid strenuous activity for several days. Discomfort is generally mild and can be managed with one or two doses of Tylenol on the evening after surgery. Bruising and swelling usually last for one to two weeks, but the patients can return to their normal activity after about four days. Pain, bleeding, infection, and change in vision are extremely rare. Blepharoplasty is a safe condition, which has improved the appearance of thousands of patients. The surgery is designed to improve your appearance and turn back the hands of time. The benefits of this surgery for most people significantly outweigh the small risk of delayed healing. 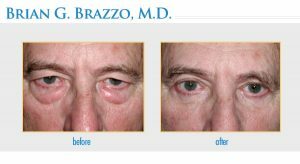 Dr. Brazzo is a trained oculoplastic surgeon in New York City who specializes in ophthalmic plastic surgery. 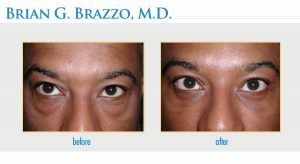 He has successfully completed thousands of blepharoplasty surgeries. Dr. Brazzo has written articles and textbooks on the topic and has trained other physicians around the United States. How do I know if I am a good candidate for eyelid surgery? Both men and women and people of all races and ethnicities can be good candidates for blepharoplasty. Most patients are older than 35; however, since ptosis (drooping eyelids) is a hereditary condition, you might consider blepharoplasty at a younger age if droopy eyelids and puffy bags under your eyes are prevalent in your family. For most patients, blepharoplasty is a long-lasting procedure. 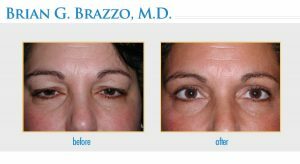 While it’s not uncommon for the longevity of results to vary slightly between patients, you can expect the results of upper eyelid surgery to last about 8 to 10 years, and lower eyelid surgery to last indefinitely. As with any surgical procedure, some scarring is to be expected. However, scarring with blepharoplasty is minimal and basically nonexistent after several months of healing. To help keep scarring minimal it is important that the surgical incisions not be subjected to excessive force, abrasion or motion during the time of healing. Will blepharoplasty get rid of my eye wrinkles? No. Blepharoplasty is not designed to remove the wrinkles at the outer corners of your eyes (crow’s feet) or to fix sagging brows. There are other procedures available that can be used to remove wrinkles near the eyes. Will insurance cover the cost of blepharoplasty? Eyelid surgery procedures are usually considered cosmetic surgery, which is not reimbursable from insurance. However, if the patients vision is impaired due to sagging eyelids, then insurance may cover the procedure. Yes, you will need a designated individual to pick you up and drive you home after the surgery. Patients who have had anesthesia will need to have someone stay with them for the first 24 hours after surgery. Your vision will be blurry following blepharoplasty for a couple of days, so you will need some assistance with some tasks and any operation of a motor vehicle. 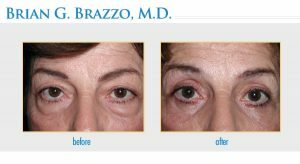 In addition to eyelid surgery, Dr. Brazzo also treats various eyelid disorders, including ptosis in New York City. After ptosis treatment, many of his Latisse NYC patients use this product to obtain naturally longer and more beautiful eyelashes. He is also a trusted facial fillers provider Botox New York City patients visit for their facial rejuvenation needs.